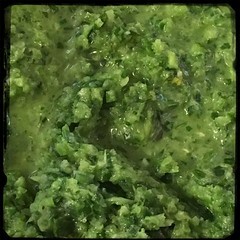 Recaito is a purée made with onions, culantro (recao) leaves (and cilantro), garlic, green peppers and ajies dulces (small sweet chile peppers), it’s brilliantly green and very aromatic. Recaito is used in Puerto Rico cuisine as a base seasoning (also known as sofrito) for many dishes. Recaito is used as a base for soups, stews, beans and rice dishes, it’s usually sautéed in annatto oil or lard first and then the other ingredients are added. Other recipes may add the recaito near the end of cooking adding a finishing touch. 1. Chop and blend all the ingredients in a food processor or blender. How to Store: Because it’s such an essential ingredient, it isn’t uncommon for home cooks to prepare large batches of recaito/sofrito in order to have enough on hand to use all week long and to freeze a little for later use. Store freshly made recaito/sofrito in a glass container in the refrigerator for immediate use or feeze in 1/4 to 1/2 cup potions for use any time.